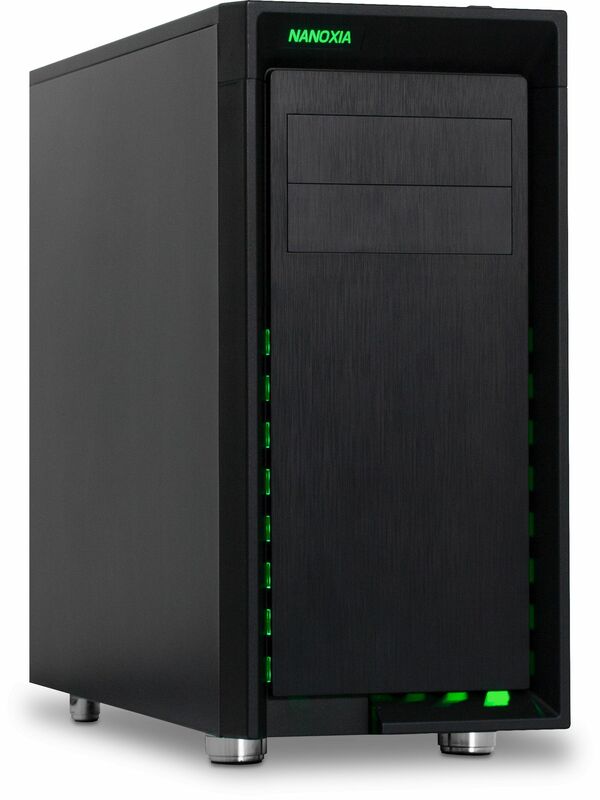 An elegant but feature rich chassis supplied with three fans and capable of accommodating water cooling components. It also features a front USB 3.1 Type-C port! The CoolForce 2 Rev.B is aimed at fans of water-cooled systems because it offers many options for installing radiators and other water cooling components. The case offers a very elegant front design whilst being a real eye-catcher, thanks to two pre-installed, green-lit LEDs. Based on the suggestions of customers of the original Coolforce 2 chassis, Nanoxia's design team developed meaningful optimisations for the Rev.B update. The case front was reworked slightly to offer the user an unhindered access to the dust filter and the front fans. The I/O-panel has been separated from the rest of the front, which allows to easily remove the front panel. 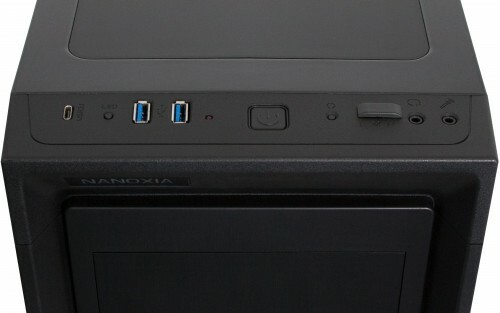 The CoolForce 2 offers a USB 3.1 connector at the front top of the chassis. The LED On/Off button for the front-mounted 30 cm Rigid LED bars has been moved to the top as well, making it easier to use. the final difference is that the Rev.B is not supplied with a windowed side panel. Nanoxia opted for silence over looks and therefore the Rev.B version has two solid side that features sound absorbing materials. The CoolForce 2 Rev.B offers many practical features, such as the Nanoxia AirCover and Nanoxia ModuWand (modular Wall). The ModuWand is one of the outstanding features of the case. If necessary, it can simply be removed to install longer video cards or it can be equipped with fans, hard drives or a reservoir / pump for a water cooling system. The front of the case is deliberately made simple, visually striking LED strips which shine through the louvers, as well as the green illuminated Nanoxia logo emphasise this point. Two tool-free mounting bays for installing 5.25" optical drives are available at the front of the chassis. At the top towards the front of the chassis you will find the I/O-Panel. 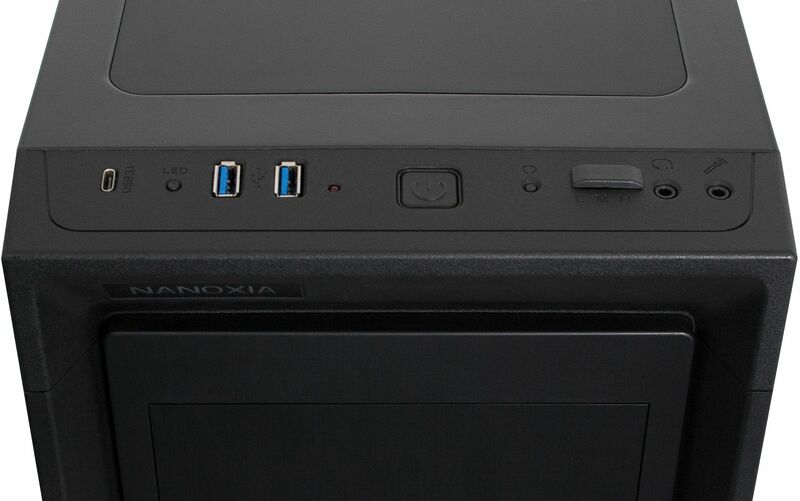 From left to right, you'll find the following; 1x USB 3.1 (Type-C) port, LED on off switch, 2x USB 3.0 ports, HDD LED, power button, reset button, 3-speed fan controller, headphone and mic ports. Also the top panel is where Nanoxia's "Air Cover"” is located. This cover can be conveniently removed when users want to install fans or radiators. This preserves the simple look of the case, without sacrificing useful features and ventilation. The side panels are equipped with the noise-reducing insulation materials. These are designed to minimise any noise generated by the installed components. The hard disks and power supply are mounted using rubber suspensions, while the whole case stands on decoupled feet thereby noticeably reducing vibrations. Another important part of the noiseless concept are the pre-installed CoolForce fans. The quiet-running models are designed for the best possible compromise between cooling performance and low noise levels. Behind the front cover, two 140 mm CoolForce fans rotate at a maximum of 1100 RPM. The fans are located in special swivelling brackets which allows for simple removal of the fans and easy access to the dust filters. Mounted at the back of the case is another 140mm fan. If the AirCover is removed, up to three additional 120 or 140 mm fans can be installed under the top. Other fans can be mounted on the ModuWand and the bottom of the case. Through this, a maximum of nine fans can be installed in the CoolForce 2 Rev. B. A pre-installed 3-speed fan controller allows to control up to three case fans, which allows an individual compromise between low system temperatures and the lowest possible noise levels, even with a full fan assembly. The CoolForce 2 Rev. B is designed as an entry-level case for water cooling enthusiasts. Behind the front panel, there is enough space for 240 mm radiators or compact water cooling solutions. Under the top cover, users can install 360 mm radiators without any problems. The case has special, laterally offset mounting points that allow maximum compatibility, especially when using particularly thick radiators. However, it may be necessary to install in low-profile RAM in this case. For fans of SSDs no less than four dedicated mounting spaces are available in the case – three can be found on the left side, as seen from the front; one is located in the back of the motherboard tray. The ModuWand also offers the possibility to mount two 2.5" or 3.5" drives – even two drives (2x 2.5", 2x 3.5") per side, if desired. The CoolForce 2 Rev.B can accommodate graphic cards with a length of up to 300mm. By removing the ModuWand, cards with a length of 430mm are able fit inside the case. In addition to high-end graphic cards, users can install CPU coolers of up to 185 mm in height. Eight PCI expansion slots are located in the rear – the installation of a multi-GPU system is therefore possible at any time. Tempered Glass Side Panel - If you are looking to show off the internal components then Nanoxia have a Tempered Glass side panel available here that will suit your needs.